Posted February 20, 2019 by Coffin Ed & filed under Arts & Entertainment, The Naked City. The Macquarie Dictionary loves to add new words to its ever-expanding volume including their much-publicised word of the year, which incidentally was “Me Too” in 2018. Despite the annual inclusion of many new words, there is a good argument to suggest that our everyday vocabulary is rapidly decreasing, giving way to a monosyllabic, text abbreviated, contrived and dictated lexicon of Instagram chatter. With spell check, Grammarly and robots now churning out news items for daily newspapers and the web, there is no longer a need for millennials to embrace language, especially when a large part of daily conversation takes place on a smartphone. 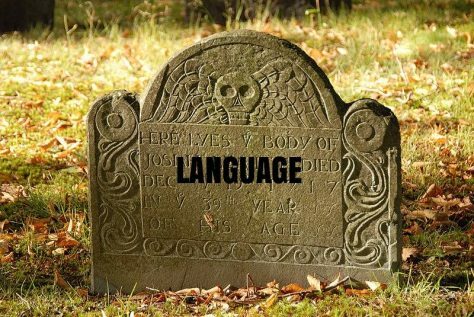 Not only are we losing thousands of words from popular use every year we have adopted a kind of modern everyday speech that is sanitised, devoid of colour and sadly lacking in humour (LOL!). We repeat like parrots the boo words and hip phrases of the influencers and twitter hounds, at the same time forsaking an incredible collection of words and phrases bequeathed to us by generations before. For such a relatively small population, Australia has over the decades, produced a wonderful anthology of both rural and urban lingo – most of it no longer in popular usage and soon to be forgotten forever. What if for one day of the year all Australians were asked to arm themselves with an old school lexicon (hey you could download the app) and converse only in the language of a bygone era. The app would immediately translate a 2019 word or phrase into something in the 50s or 60s. If the kids are playing up when you finally arrive home you might tell them “stop doing the dance of the wounded wombat” and threaten them “with a taste of your slipper.” If that doesn’t work you could give them all a “good shellacking.” The ankle biters might tell you to “not blow a gasket” and you retreat to your bedroom to take in a cup of tea, a Bex and good lie down.